A bomb robot in Arlington, TX, during the 2011 Super Bowl. Will more such machines quell our quandaries? After the terrible tragedy this week in Dallas, where five police officers were murdered by a rogue gunman, reports emerged that the shooter was not stopped nor detained, but rather was killed…by a robot. According to gizmodo.com, the Dallas Police reported that a “bomb detection robot attached with an explosive device” was the response to the fatal shootings. 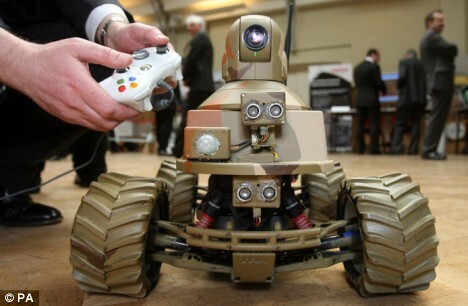 It is being considered the first lethal use of a military-grade bomb robot in the service of a civilian police force. While no specific details have yet been released, an assortment of experts have speculated that the death-dealing droid is a Marcbot-IV model, which has previously been used by U.S. soldiers during attacks in Iraq. Resembling a souped-up, $8,000 remote-control truck, the Marcbot is equipped with miniature monster-truck tires and a camera on an extendable arm. It is maneuvered in the most amenable modern fashion possible: via an Xbox controller. This little guy is just a recon robot, but you get the idea. 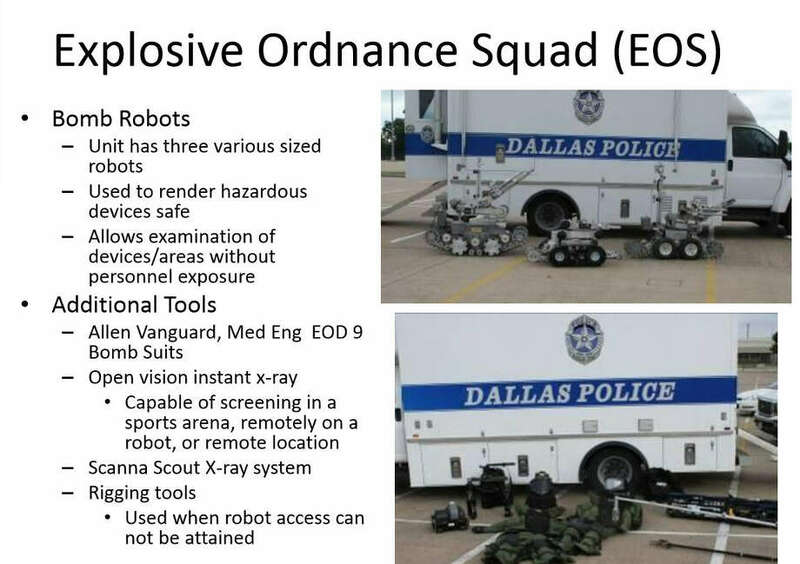 Other models of bomb-disposal ‘bots owned by the Dallas Police Department apparently include a Northrop Grumman Remotec Andros F6 and Mark 5A-1, both with significant price tags and features. The Grumman robots include wheels to help climb stairs, and color cameras mounted on arms with seven degrees of motion. As the gunman was reportedly cornered on a second floor, it is therefore possible that one of these luxury vehicles for bomb disposal was used to dispatch the gunman. The question, however, is not which robot did the killing, but whether such tactics will now become commonplace in crisis situations. While these robots, like drones, are of course not autonomous, one wonders if they offer a skill set significant enough to outdo a trained, thinking human physically placed in a similar situation. Options: a few of the tools in the Dallas PD's arsenal. If this article makes you fear for the future of robotic police brutality, it’s worth mentioning that a police robot was once used todeliver pizzas for the purpose of diffusing a suicide situation. So maybe a happy co-existence between ‘bots and boys and blue CAN be attained. Also, real delivery robots are becoming a thing soon. 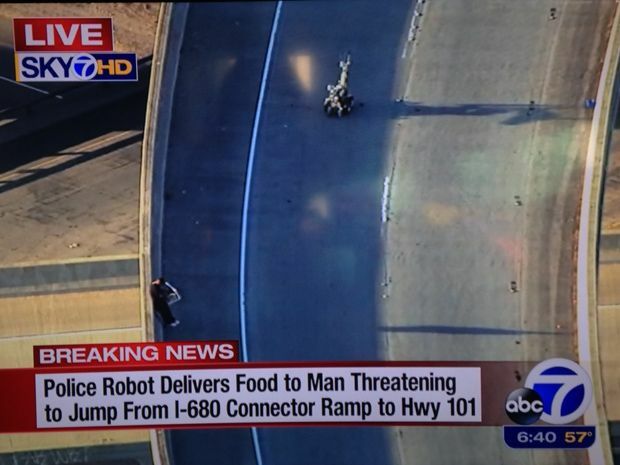 The future may be frightening, but also well-fed. Now thats a really awesome video game.When can i buy it..HAHAHA.